6 DUCK SALADS: A Cartoonists Lunch with Gus Van Sant. Last month I was invited to have lunch with a bunch of New Yorker cartoonists and the film director, Gus Van Sant. Gus directed of some of the greatest films of the past 20 years: "Good Will Hunting", "Milk", "Drugstore Cowboy", and has just released another brilliant film about the cartoonist John Callahan, "Don't Worry, He Won't Get Far On Foot." The invitation came from the Cartoon Editor of the New Yorker, Emma Allen, at our weekly Tuesday cartoon meeting. I was flattered to be asked, and to say the lunch was surreal is an understatement. I was more starstruck by some of the other cartoonists who showed up than I was by Gus! The lunch took place at the decades-long traditional weekly 'cartoonists lunch' which usually takes place following the Tuesday cartoon meeting at the New Yorker. We shuffle up to Pergola Del Artistes in the Theatre District and talk shop over duck salad and cheap red wine. 6 of us ordered the gigantic duck salad and noshed away as Sam Gross held court, telling stories of his experience with Callahan and with other New Yorker cartoonists. Gossip and scandal aplenty! 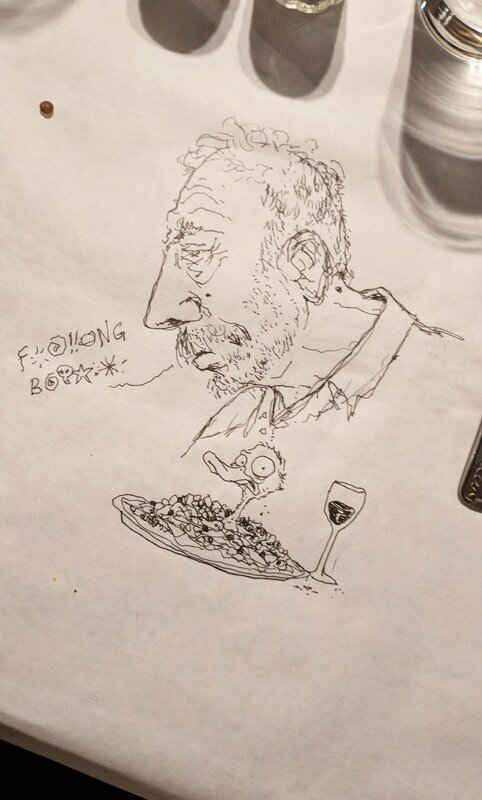 At one point I scribbled a quick portrait of Sam on the tablecloth and pitched a gag caption for one of his cartoons to a tableful of eye-rolls. Emma wrote up the goings-on at the lunch in this week's New Yorker in the "Talk of The Town" section.